New guidance from the American Academy of Pediatrics (AAP) recommends all pediatricians do the same. The organization says playing with parents and peers is a critical part of a child’s healthy development, fundamental for learning life skills and reducing stress. “Play is not frivolous: it enhances brain structure and function and promotes executive function,” the report, published this week, states. The AAP and the Centers for Disease Control and Prevention recommend children get one hour of physical activity per day, as well as one hour of simple, creative play. Lead author of the report, Dr. Michael Yogman, says play often gets a bad rap as being a waste of time, which he says is highly inaccurate. Play also mitigates stress, allows children to learn risk-taking, nurtures safe relationships with caregivers, and teaches language, social and emotional skills, says CBS News medical contributor Dr. Tara Narula. The type of play the researchers in the report refer to is when children are actively engaged and there is joyful discovery. And you don’t need expensive toys or devices. “You can use wooden spoons at home, or boxes. There are so many cheap and simple things that can become play for kids in your house,” Narula said. The report also found that play time has decreased significantly in the past 15 years, while screen time has increased. 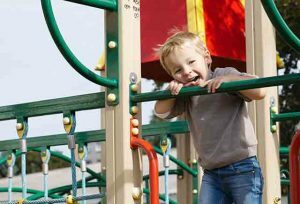 And because of increased academic pressure, about 30 percent of kindergarten children don’t go out for recess. Play ideally starts at the earliest stages of childhood, soon after birth. “You smile. They smile back. This teaches non-verbal skills,” Narula said. Play should continue through the teen years. Researchers say there are many things parents can do to encourage play. They recommend getting kids outside more to explore nature, as well as introducing them to music and dance and art.